Other than 30 Rock, I haven’t seen a good network comedy in a long time so I had no expectations when I tuned in for the pilot of ABC’s Better Off Ted, a new sitcom from Victor Fresco (Andy Richter Controls the Universe). It wasn’t genius but made me chuckle. Then I tuned in again last week and the second ep made me laugh out loud. The humor is definitely absurd and may not be for everyone but it worked for me. The setting is at a corporation, Veridian Dynamics, that claims it can make anything, like turning a pumpkin into a weapon (by growing deadly mold on it) or beef without cows (by growing it in a lab). 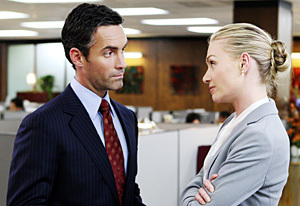 Jay Harrington stars as Ted, a research & development executive, and Portia de Rossi is his hilariously pompous boss. 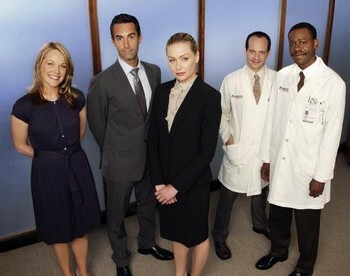 The strong supporting cast includes Andrea Anders (Joey) as a sweet but slightly nutty co-worker and Jonathan Slavin & Malcolm Barrett as a pair of bickering scientists. If you find any of this funny, check out the show tonight (Wednesday) at 8:30 p.m. on ABC and let me know your thoughts. You can also see the first two eps on ABC.com. I really like this show! Glad to hear someone else shares my interest. That opening promo thing they do is funny and creepy at the same time. I love it! Totally creepy, but there are some great one-liners! PCN named a few, but there’s much more! The relationship between the two lab guys is THE BEST!!! I love those two guys! Besides Veronica, they’re my favorite characters. I thought I was the only one watching. This is a funny show, but I hope they don’t run out of steam. So many shows (like Andy Richter’s last two) just can’t go the distance. Always been a fan of Jonathan Slavin. He’s, like, from another planet!! I wish you had a clip of that dance number between him and his lab partner! Oh my gosh, their dancing was SO ridiculous! It made me think of Elaine and her infamous dance on Seinfeld. Always keen for comedy ~ here in Australia, apparently Channel 10 has the rights but hasn’t scheduled it yet. Fingers crossed. I love how you’re always up on stuff, ShelleyP. I wouldn’t know if my local TV stations had the rights to my life story. Yes, but when was the last time I finished a book?! !